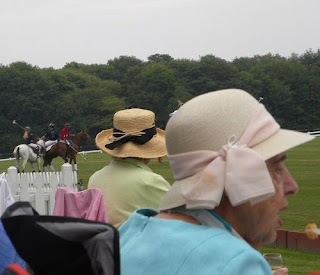 Last weekend we were supposed to go to a concert, but at the last minute we decided to avoid the big crowds and join a friend to watch our very first polo match. It was delightful!! 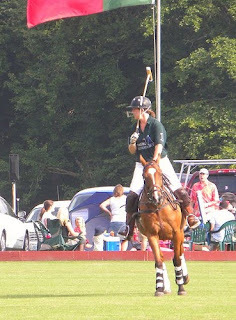 The atmosphere was so relaxing and the horses and players were spectacular. Here are the two rival teams above. 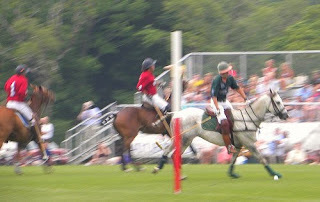 There are 6 periods to a polo match called "chuckers." After each chucker the players change horses because playing 2 chuckers in a row is not allowed as it is too hard on the horses. They all bring their own steeds. Some bring three and play them every other chucker, and some bring 6 and use each horse only once. Imagine the loot it takes to do this! They are so good to these horses. I was told that these animals go through rigorous training learning to turn on a dime and to not be intimidated by the slashing and swinging of the poles. Look at what great shape they're all in! The players are getting ready. Look at this handsome fella. The player ain't bad either! Many countries come here to play. What's interesting is that they obviously can't bring their own horses, so they have to find the time to spend with the horses they'll be using so they can get used to them before a match. That's a huge disadvantage, but as I said, these horses are trained to play the game and all commands are universal. I hope to be going back this month to see The Netherlands play!! One of the referees. Looks like he's meditating before the game! Here she is heading for another goal!! This was one of the fastest horses on the team. They saved the big guns for the finale! And here's my team making the winning goal!! I took this photo for Teri who is into painting hats lately. 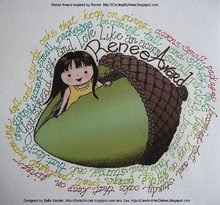 Click here to see what she did! These ladies sat next to us. We were all enjoying our wine and munchies as we were treated to a great day of polo. This is a great post Lolo. I have never been to a polo match nor ever heard an explanation of what is going on. Thank you. And thank you for sharing those wonderful hats with me. sounds like you had a great time and learned a lot about the game. glad they treat the horses kindly. 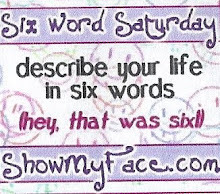 thanks for sharing the fun. Lo......I love this post! Polo is such a thrilling sport - and you explained it beautifully! I watched many a game when I was in the UK, but have never seen one in the States. (But, yes, I JUST DID, didn't I!) It's great to see women playing.... The horses are DIVINE! Each one strong and perfect! Perhaps one day, we'll watch a game together......meanwhile, I KNOW who you will be viewing the Netherlands game with! Ha-ha! to me horses are the most magnificent animals in the kingdom. even as a little girl i wanted a relationship with one. 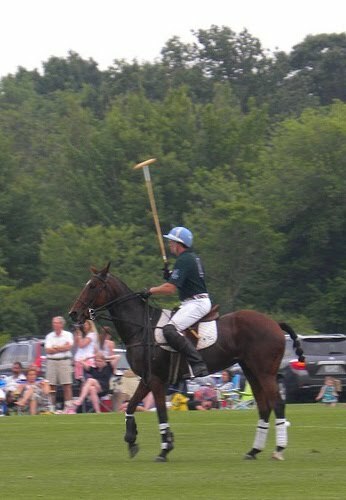 i imagine polo matches as aristocratic. did you hold your hand just so while sipping your drink? what fun. i love accompanying you and your camera on all your gallivants. 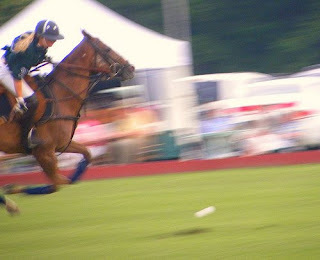 I have never been to a polo match in my life, but enjoy the bits I see on TV. The horses look so...hmmmm....what word am I looking for....ALERT. It is different than dressage or other riding...they really must know the game! Looked like a fun time. The horses are in wonderful shape. but how do they keep from being hit with the ball or the thing they whack them with? That's some great photos. You certainly educated me on the game of polo.....it's not just a shirt! :) Hope you are well this summer. I hope to catch up...at some point! What a lovely post this is! So good to read the people arte so good to their horses! They deserve that. For me it is just nice to know and this post makes me appreciate this sport even better. 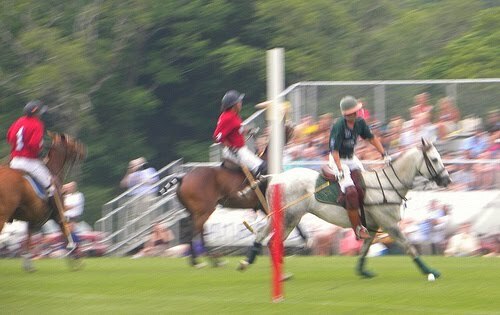 I have never been to a polo match in my life. Thjanks for sharing this fun day with us. Teri did a great job on those hats! This is great and your photos are wonderful. I've never watched a game but I can understand why it takes so much money to play. Did you ever watch "the honeymooners"? with Jackie Gleason? 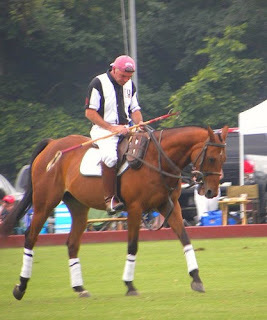 Do you remember "poloponies"??? What an interesting day out. Ihave only seen polo on tv. I can imagine hearing the sounds and the smells must be outstanding. I am glad you shared your outing with us. This is wonderful! I'm so glad you got to go! 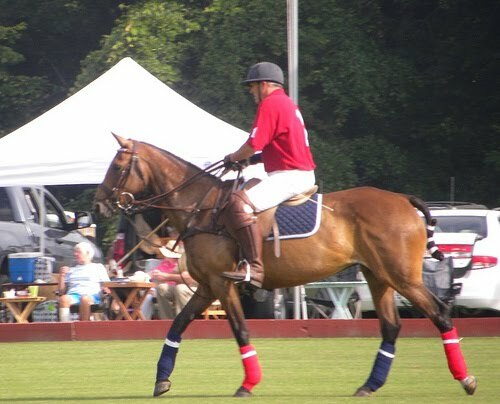 I lived in South Florida for a few years, in a very polo-centric area (in the winter many apartments in our complex were rented by handsome players! ), but we never went to a match, to my disappointment. Thank you for sharing. Did you wear a hat? I would have been oggling too. Such fun!!! Thanks for it all. Oh, Lo, that was fun, even from here. I loved the horses and the white one stole my heart. Thanks for sharing. Most interesting post, Laurel. The hat photo was so sweet. I check in at Teri's. Such a pretty interpretation. lovely day...and so cool you got to see your first polo match! i've never been to one, but near us in Wellington, Florida is a huge polo place. even King Charles has been to play! woo-hoo!! Oh how fantastic your photos are Lolo! 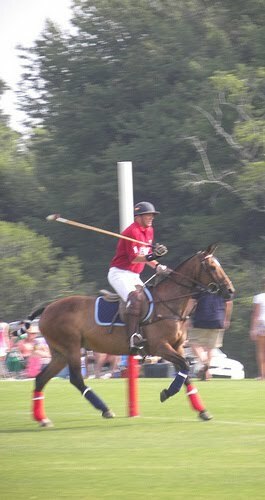 I love polo, we live right behind Santa Barbara Polo and Racquet Club. The summer season has begun and sundays are polo days. We have friends that are trainers (as well as players) and the gorgeous horses are treated like royalty. It's really fun here when international teams come, the Argentinians are SO cute! when they are done playing they are all around town. So glad you had a good time! Thank you for sharing. Your pictures were so great I almost felt like I was there. I really like the design of your blog and how your pictures look on the black back ground. Very eye catching. What a great outing Laurel - something really different! I love the action photos - I've always wondered how the players manage to swipe the ball and not the horses! Wow Lolo, what a fun post to read. Thanks for sharing all the pic's. I went to one polo match a long time ago. It was fundraiser for my son's school. It was interesting. Love this.!!! Thanks for always coming to visit me. Wonderful to see,Lolo no orange hats there? 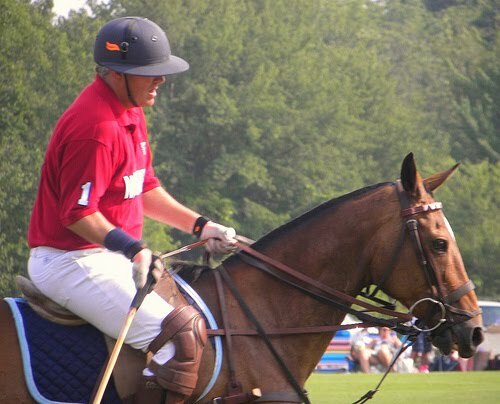 One segment of a recent PBS Special on horses featured a professional polo player ... I was amazed at how much effort, energy, work and money went into it before the first chucker was ever played! ha ha polo matches are so british. wouldn't mind seeing prince William astride a steed. You've captured the game beautifully, lolo!!! I'm glad to hear of a woman on the team...times have changed. I grew up on a horse farm and we used to pretend we were polo players once in awhile. 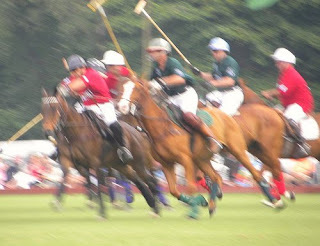 It was great fun, but nowhere near as disciplined as real polo is. 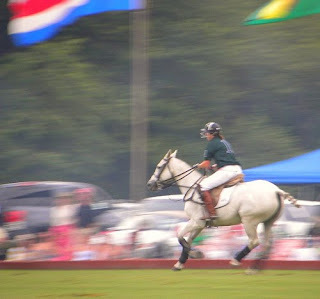 I wish I had been there to see it...there is nothing like a well-trained steed playing polo. To me, the riders are incredible athletes. It takes great courage to go thundering after a ball like that! I love going to different events lolo. Jim and I went to a 'hurling' match which was fantastic - and so fast. The players have to be inceredibly fit. Thanks for explaining something of the game of polo - I loved your photos and I'm glad your team won! I saw Teri's lovely hat painting taken from yours. 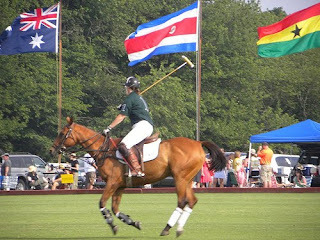 I would love to attend a polo match! It looks like so much fun and I would love to watch the horses run. It's always amazing to see well trained animals do what they do best.